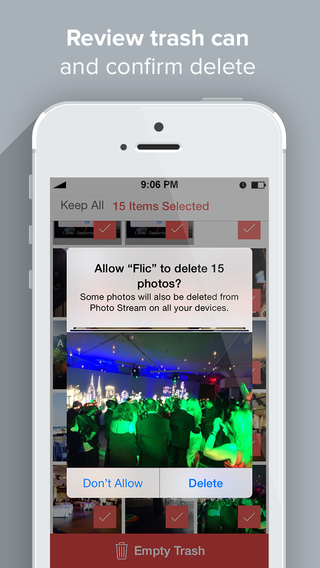 Flic is the easiest and fastest way to delete photos from your camera roll. Named "Best New App" in Apple store and raved about in 30+ publications, Flic is the #1 Camera Roll Management app. With Flic, you can manage all the photos in your camera roll with ease. Take the time and pain out of deleting duplicate photos and poorly lit pictures that take up valuable memory storage space on your phone. Open Flic and scroll through your entire camera roll, one picture at a time. Then swipe left to trash a photo and swipe right to keep it, it’s that simple! Flic even tells you how much memory space you will save from deleting the selected pics. Save time and space with Flic and download the app today! For any questions or suggestions about the easy to use, camera roll manager Flic, reach out to us at: flicsupport@lifehacklabs.co.